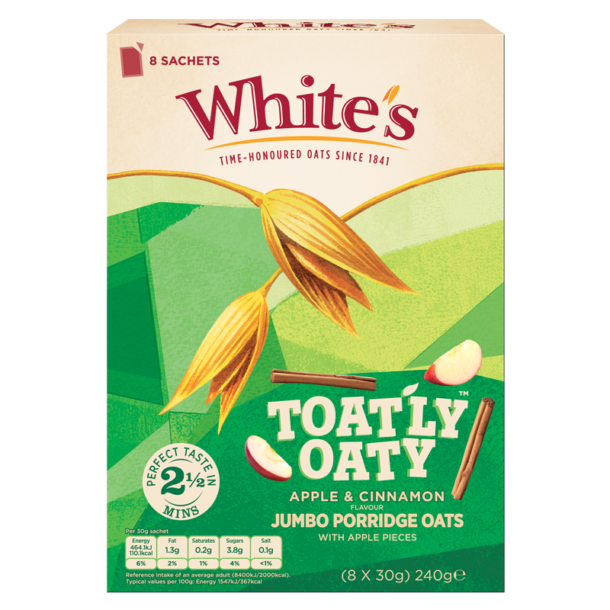 Hearty and delicious quick cooking jumbo oats with juicy apple and notes of sweet cinnamon, gently steamed and rolled for a proper porridge full of flavour and texture. Packed in individual microwaveable sachets which can be easily prepared in just 2 minutes for a convenient start, so even if you’re short on time, take a moment to enjoy our deliciously creamy porridge. *porridge oats are a source of soluble fibre beta glucan which has been shown to reduce cholesterol. High cholesterol is a risk factor in the development of coronary heart disease. One 30g serving of oat bran provides 1.1g of beta glucan soluble fibre which is 36% of the suggested daily intake of 3g of beta glucan.